The Garden invites its visitors to see and enjoy open air exhibitions, arranged as an impressive park, historical Vineyard of St. Claire, Japanese Garden, tropical greenhouse Fata Morgana together with numerous festive and educational events, targeting visitors of all walks of life. Also of importance, the natural surrounding is far away from the disturbing influence of the city. The Garden is under continuous development, new expositions are emerging. This may be the reason of imaginary disconnection of the whole area of the Garden. So called "Southern Grounds" is especially worth of seeing because of its open space exhibition with Japanese garden and St. Claire´s Vineyard, "Northern Grounds" are inviting visitors to see another open space exhibition with Peony meadow and a collection of frost-hard cacti, nicknamed "Mexico". Curator's Name: Vlastik. Rybka, Ph.D.
Project “Garden” aims to provide access to nature for all visitors including children, seniors and visitors with special needs, by enabling all visitors to move freely around Prague Botanic Garden with minimal restriction. The project places particular emphasis on opening the Garden to the visually impaired, as an important contribution to their full engagement, inclusion and integration into society. The project’s key objectives are to create information systems for all categories of visitors, and organize exhibitions and workshops that utilize all of the senses, removing barriers to participation. Started in 1996, the project is ongoing. “It is very important to adapt the Garden to [visitors’] needs without building separate specialized gardens, which we feel are more like places reinforcing unwanted isolation of people with special needs”. Open-air botanical exhibits in the southern, central and northern sections of the Garden introduce visitors to over sixty interesting plant species, with information in Braille and regular text printed on free-standing orientation charts. The charts form a specialized sound-navigation system for visitors, transmitting information based on the conductive capacity of human skin. Visitors simply touch the opposite side of a chart to hear a commentary on the different plants around them. Other navigation aids include a tactile plan of the southern part of the garden composed of forty information stands, and sound beacons with audio directions to various key places in and around the Garden. The majority of exhibitions and facilities are accessible to wheelchair users and disabled parking and free rental of wheelchairs is available. Disabled visitors with a special health card may enter all exhibits free of charge. Over a hundred intriguing items of plant, animal or mineral origin, such as ostrich eggs, fossils, pine cones and fruit, are brought together in a multisensory display, with informative legends in regular text and Braille. The Garden’s multisensory exhibitions demonstrate a vital element of visitor inclusion; each exhibition is designed to be a true experience to encourage visitors to enrich their experience by using not only their sense of sight, but also touch, smell, sound and taste. Professional guest conductors are on hand and visitors are provided with a sound companion and labels in Braille and regular text. The Garden holds seventeen tactile exhibitions per year, with the overarching theme changing annually. Since the initiation of Project “Garden” in 1996, Prague Botanic Garden has seen an increase in visitor attendance and positive feedback. Within the Garden, the project has revolutionised information systems and introduced modern technology available in multiple languages. Project “Garden” has become especially popular among the community of visitors with special needs. Before 1996, significant preliminary preparation was required for all visits by special needs groups. Now, people with special needs are able to visit individually as well as in groups, with a recorded average of 4,000 special needs visitors per year. 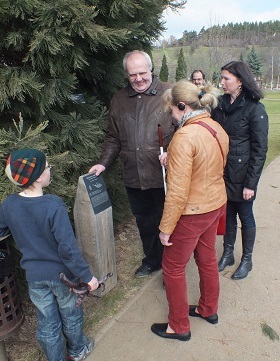 Hailed as an inspiration to other botanic gardens and social institutions in the Czech Republic and throughout Central Europe, the project has gained recognition by the media as well as with visitors. In 2003, the natural objects collection for the visually impaired was awarded The Olga Havel Award. Crucially, the project continues to fulfil its objective of helping to integrate minority groups into society, whilst inspiring other social institutions to follow its example. Project “Garden” was originally intended to enable visually impaired people to experience nature through their other senses. However, it soon became clear that the project was enriching all participants, regardless of whether they are handicapped or not. Gradually, the project developed a widely applicable method of conveying to the public the fact that nature can be perceived in a host of different, multisensory ways. The Fourth European Botanic Gardens Congress EuroGard IV was held near Prague, in the Czech Republic, in September 2006. Selected proceedings are now available online for download. Over 100 delegates at Eurogard IV, the 4th European Botanic Gardens Congress, issued a series of resolutions to meet conservation committments. Emphasis was on the need for communication and networking, access and benefit sharing and the role of botanic gardens in combating invasive species.